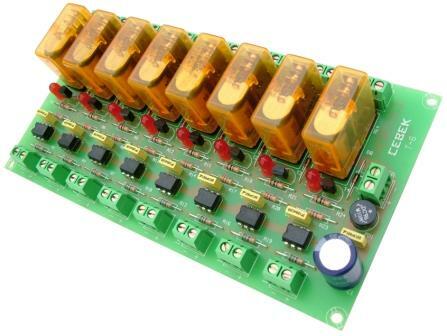 Cebek T-6 requites a 12 volt DC supply to power the eight independent opto-coupled relays. When a DC voltage of between 3 and 24 is applied to the corresponding input the SPDT relay will be energised. It allows for very easy connection to any low voltage device which has low current drain. An LED gives visual indication when the relay is energised.